Before Chinese New Year, the people would like going to the fair to buy some foods which are not available from the supermarket for the family, even the price is a little expensive then normal, but the quality is more fresh and good enough. 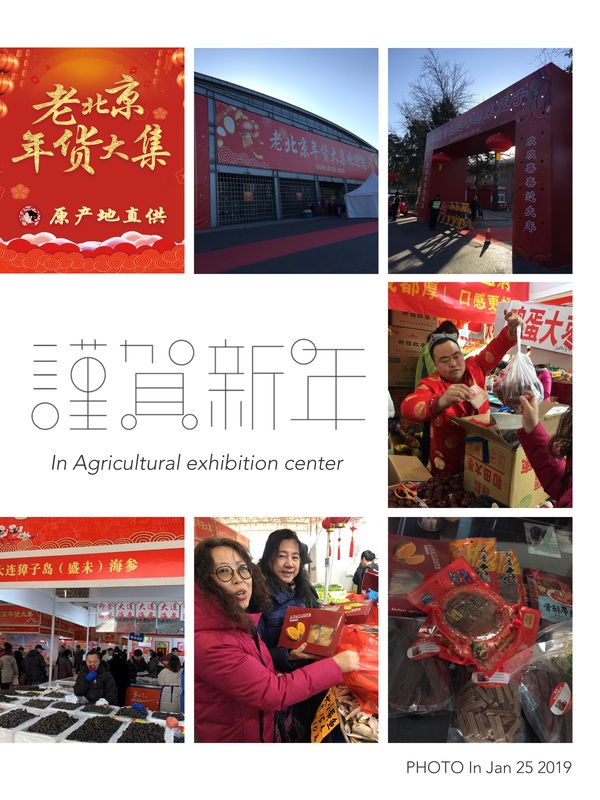 Agriculture exhibition centre is located in third ring road, the place for is one of famous Annual fairs every year in the Beijing, because of it is not too far from our living. So we had the appointment to be there this morning. After security checking and Scan ID you can access for the qualification only, no need any tickets, I remembered we had to found the tickets first either from the internet or buying from street vendors at the last few years before. Right now everything is getting normalization. I was a little early than others, so I went around the counters first, the atmosphere of Spring Festival came to my face, the red copybook at everywhere, there were a lot of fruits, wine, coffee, seafood, everything inside, the assistant of the seller spoke louder with the microphone, he wanted you stop their counter to taste the foods for a while, for sure they did not force you to buy, just gave them the support for popularity. Frankly speaking before you go to the fair, you don’t need have the breakfast, tasting this and that including drinking the coffee or coconut milk, or have the sausage, before my friend’s coming, I have full already. I prefer to buy instant foods, smoked fish, Jelly fish, and abalone which are very easy for cooking. Tell you the truth, go to the fair, you can bargain with the seller, especially for bundling sales. If 100 for three bags is the quotation, at least you can get it four or five bags in 100 yuan finally. One hour later the bags were full, two hands were occupied, We hate that we did not take a cart for hand carry, everything we wanted to buy, just abilities not equal my ambitious. Very good experience at the fair, I took many photos to share with you here. The new year is coming around the corner. Well prepared for the Spring Festival. Have a good weekend. teadrinking: The new year is coming around the corner. Well prepared for the Spring Festival. Have a good weekend. Yes, it is quite a long time not seeing you. Happy Spring Festival in advance.